“An eminent man saw I to-day, a solemn one, an intellectual penitent: oh, how my soul laughed at his ugliness! Clothed was he in ugly truths, the spoil of his hunting, and rich in torn garments; many thorns also hung upon him - but I saw no rose. Not yet had he learned laughter and beauty. Frowning this hunter returned from the forests of knowledge. From strife with wild beats came he home; but a wild beast looketh yet out of his seriousness - a beast that he hath not overcome! He standeth there like a tiger, about to spring; but I love not these tense souls; these reserved ones are not to my taste. If he would but grow weary of his eminence, this eminent man - then only would his beauty begin - and then only should I taste him and find him to my taste! And not until he turneth from himself will he leap over his own shadow - lo! straight into his own sunshine! Half of the chapter "Of Eminent Men"
Pretentiousness can be used to mean a few things, i.e., empty-posturing: Pretending to be something you're not. Allowing this within society leads to an empty hollow, a balloon-ego, where people feel good no matter if they can come up with the goods or not. It can also mean taking oneself too seriously. This passage from Nietzsche matches this second definition. Not seeing the humanity, the exotic, and the aesthetic nature of life leads to this pointless pursuit of knowledge. No amount of knowledge can make up for a desolate character. If the balance of power-knowledge is not set correctly, through beauty, friends or aesthetics, then that knowledge does you no good. Without balance, without aesthetics, knowledge drains you. It makes you weak, slow, ugly, spoiled, tense and shadowed. Self deprecating humour was my own first step away from this type of pretentiousness - the ability to simply dismiss yourself, or realize that no matter how hard you try sometimes you're just fighting a downhill battle. To realize that no amount of knowledge can readdress the balance of inner beauty, without laughter. 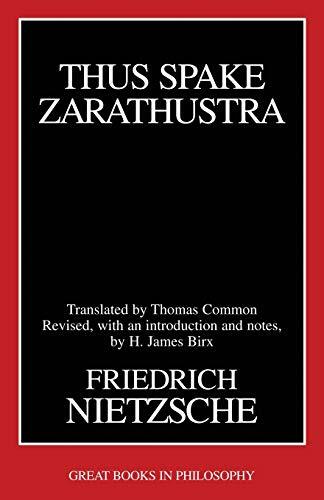 (1885) Thus Spake Zarathustra. A paperback book.